In choosing books to read on the subject of yoga and other cults, I found this book by Yungen who has studied the New Age movement for thirty years and has found yoga to be a central part of that subject. It is published by Lighthouse Trails Publishing, 2007, 2015. Yungen writes, “A perfect example of just how widespread Eastern religion has become in our Western world is the popular practice of yoga. In the beginning of the 21st century, around twenty million Americans are doing this practice based on Eastern religion, often in church recreation halls and at the YMCA” (p. 50). After quoting a Catholic defense of yoga retreats and Zen meditations, Yungen says, “I wonder how it is possible that Christians can use the same techniques that Buddhists and Hindus use to reach their gods without, in fact, reaching their gods (sic). Metaphysical meditation remains exactly the same no matter what name you tag on it. 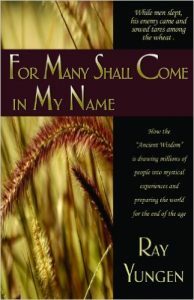 Changing the mantras does not make it Christian” (p. 122). Yungen divides his chapters into the use of various New Age materials in business, in education, in alternative health, in arts and media, and also in religion, showing how pervasive yoga, meditation, centering prayers, etc., have become in American religious life. He ends his book with a chapter on prophetic things, and then lastly with a good gospel presentation.